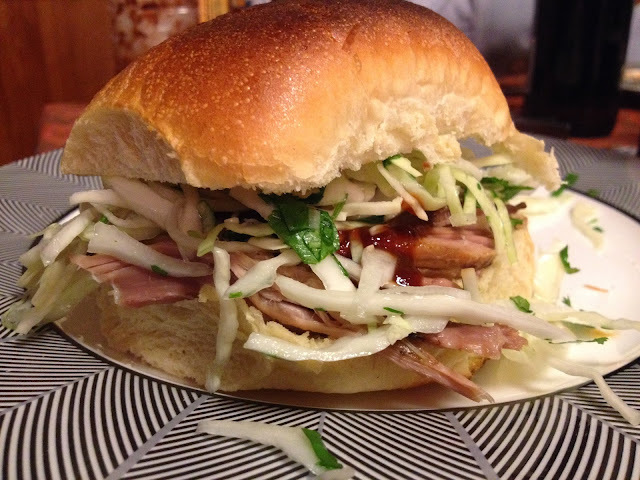 This is a simple side dish, or a great topper for a pulled pork sandwich which is how I purposed it. Variations of this are endless of course but I did enjoy this combo. Split cabbage half into 2, and remove core. Slice on a mandolin or with a knife into uniform strips (short way) about 1/8 of an inch thick. Toss with salt in a large bowl. With your hands, squeeze cabbage strands and "massage" in the salt for about 1 minute. Chop scallions and add to the cabbage. Mix vinegar, water, sugar and cilantro. Pour the dressing over the cabbage and toss quickly. Let stand for about 10-15 minutes and it's ready to eat.